Located in Lexington, Kentucky, and serving the entire state, law firm O'Brien Batten & Kirtley, PLLC, represents clients in medical malpractice, nursing home negligence and personal injury matters. With over 80 years of combined experience, the lawyers at our firm have handled thousands of cases statewide. When clients are injured as a result of negligence, they want to seek justice, to be compensated for their expenses and to make sure the negligence doesn't happen again. We have the resources to see the case through from start to finish, meeting all of these objectives. We are trial attorneys, and we never shy away from taking a case as far as it needs to go to get our client the results they deserve. Our staff is welcoming, and our attorneys will work with clients closely to better understand client objectives. 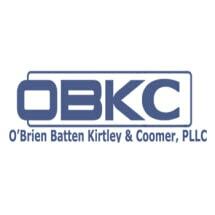 If you have an injury and need compassionate and experienced counsel, O'Brien Batten & Kirtley, PLLC, can help. We take cases everywhere in Kentucky and will travel to you to find out more about how we can advocate for justice on your behalf. We offer free initial consultations for all potential clients.